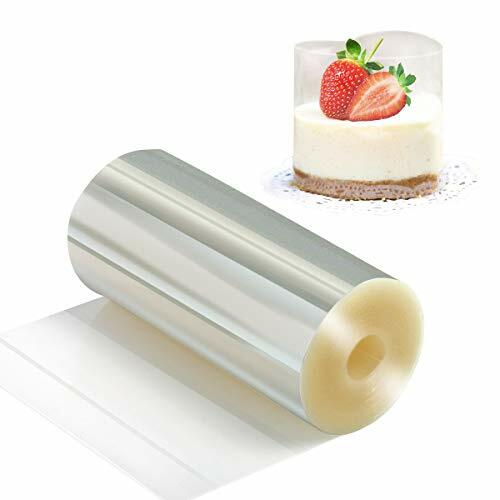 Cake collars size: Each Roll 10cm(W) x 10m(L) x 125micron(Thickness), 3.9inch x 394inch x 125micron, 4"x32.8(ft). 100% Made of high quality food grade PP, guaranteed non-toxic. Use for chocolate baking, cake decorating, lining rings and molds in the kitchen. It's satisfied the baking temperature degrees below zero from 60°c. Smooth surface, high clear, and soft enough, peel easily from mousse cake. Help you protect the cake complete without damage, perfect for cakes up to 30cm wide. Free Tools Provided. Each roll enclosed 1 sheet of sticker( 10pcs), it can be use to tape the seal of cake collars after cut. Triple-wrapped package, make sure the cake collar clean and sanitation.